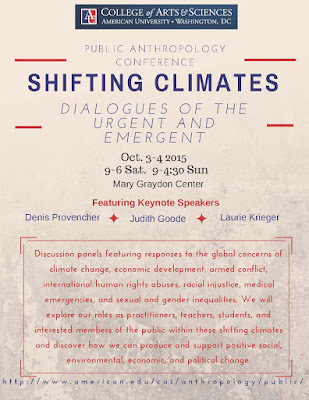 This weekend, Oct. 3-4, American University will host its 12th annual Public Anthropology Conference at the University's Mary Graydon Center. This year's theme, Shifting Climates: Dialogues of the Urgent and Emergent, has allowed for diversity in both panel topics and presenters. The Conference's featured keynote speakers are Denis Provencher, Judith Goode, and Laurie Krieger. Current students Jorge Benavides (PhD) and Emma Louise Backe (MA) will be participating in the session titled "The Intersections of Anthropology and Public Health" scheduled for Oct. 3rd at 12:30 pm. The panel will be moderated by current MA student Beth Moretzsky. Additionally, Department of Anthropology Alumna Kaitlin Carson (MA 2015) will be presenting as part of the session titled "Innovations and Reconsiderations of Aid in Africa" scheduled for Oct. 3rd from 9:00-10:50 AM. In addition to current and former students, two former Department of Anthropology faculty members will be participating. Lauren Carruth will be joining Kaitlin for the "Aid in Africa" session and Scott Freeman will be participating in the session titled "Public Anthropology in the Peace Corps" scheduled for Oct. 4th from 9:00-10:50 AM. For more information, visit the conference web page here and review the conference schedule after the jump. This Thursday, September 24th and Friday, September 25th, George Washington University's Elliott School for International Affairs will play host to a workshop bringing together contributors to an edited volume on "roboprocesses". Co-organizer and Chair of the workshop Hugh Gusterson describes roboprocesses as "...the kinds of scripted algorithms banks use to decide whether you get a mortgage, governments use to decide whether you're a security risk, etc". Fresh from an appointment at the Institute for Advanced Study at Princeton where he studied the use of polygraphs in the national security state and in popular culture, Dr. Gusterson officially joins the faculty of the GW Department of the Anthropology this fall. 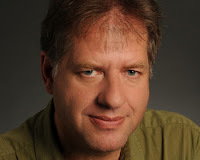 His areas of expertise include militarism, nuclear culture, the anthropology of science, ethics, international security, public anthropology, and methods. View the Roboprocesses Workshop schedule, including participants and discussants, after the jump.